Welcome to the first installment of our blog series showing how to build some of the most popular end-to-end experiences used by mobile apps. In each installment, you’ll see how you can build these experiences – including the client (iOS and Android) and the backend (AWS services) – in just a few minutes. We’ll typically use AWS Mobile Hub to accomplish this; Mobile Hub simplifies many of the steps you would normally have to go through, including authenticating users, securely configuring backend services, running backend code, and generating reference iOS and Android apps that use these features. We’ll then dive deeper, showing you how to integrate the experiences into your own applications and explaining what is happening within Mobile Hub. Through the series, we’ll touch on a number of AWS services, including Amazon Cognito, Amazon S3, Amazon DynamoDB, and AWS Lambda. We welcome your suggestions in the comments for additional experiences or AWS services we should highlight! Let’s get started with our first installment. This first post is about uploading photos to and downloading photos from the cloud from a mobile application. You’ll walk away with a fully functioning mobile application connecting to your AWS backend resources. There are three steps in this tutorial. Step 1. Configure the backend AWS resources via AWS Mobile Hub. This consists of creating a project, enabling a single feature called User Data Storage, and building/downloading the iOS Swift sample app source code project. Step 2. Explore uploading to and downloading photos from Amazon S3 using the sample app generated by Mobile Hub. Step 3. Store and Retrieve Photos from your own app by following the AWS Mobile Hub integration guide customized for your project. First, we’ll explain briefly what Mobile Hub is and the AWS features (Amazon S3 and Amazon Cognito Identity) that we’ll enable within a Mobile Hub project. AWS Mobile Hub simplifies the process of building, testing, and monitoring mobile applications that make use of one or more AWS services. It can help you skip the front- and back-end heavy lifting of manually creating cloud service configurations and integrating them into your client. The mobile app features supported includes user authentication, data storage, backend logic, push notifications, content delivery, and analytics—all from a single, integrated console. There is no charge for Mobile Hub; you only pay for the AWS services used. For example, after you complete this tutorial, you are only charged for the objects stored in your S3 bucket. Learn more about AWS Mobile Hub features. Amazon Cognito Federated Identities enable you to create unique identities for your users and authenticate them with identity providers. With an identity, you can obtain temporary, limited-privilege AWS credentials to synchronize data with Amazon Cognito Sync, or directly access other AWS services. Amazon Cognito Identity supports public identity providers—Amazon, Facebook, Google, and SAML identity providers—as well as unauthenticated identities, which is what we’ll be utilizing in this tutorial. Learn more about Amazon Cognito Federated Identities. Amazon Simple Storage Service (Amazon S3) provides secure, durable, highly scalable object storage in the cloud. Using the AWS Mobile SDK, you can directly access Amazon S3 from your mobile app. The AWS Mobile SDK allows you to consume the Amazon S3 service in your mobile application via the S3 Transfer Utility. The fully functional iOS sample app generated by Mobile Hub includes the AWS Mobile SDK for iOS, S3 Transfer Utility, and all the helper code for running the demo app used for this tutorial. Learn more about Amazon S3 cloud storage and pricing. We’ll use Mobile Hub to create a project and then enable the User Data Storage feature to store and retrieve photos from Amazon S3. We walk you through the steps and follow up with a recap (explain the magic) of what just happened. 2) Select Create new mobile project. 3) Provide a project name, S3Blog, and then select Create project. 4) Select User Data Storage. 5) Select Store user data and then choose Save changes. 7) From the integration tab, make sure iOS Swift is selected and that you are in the Getting Started section. 8) Select Download a sample app to download your iOS Swift project source code (zipped project folder). We’ll run this project in Xcode in just a minute. Done. You now have all your AWS resources configured and the custom-built iOS Swift source code project is downloaded and ready. First, we created a new project in AWS Mobile Hub. Note that, for each Mobile Hub project created, an Amazon Cognito identity pool is created on your behalf, regardless of what features are enabled. Amazon Cognito Identity is being used in our app to obtain temporary, unauthenticated, limited-privilege credentials to directly access Amazon S3 from a mobile app. In a future blogpost, we’ll discuss the Mobile Hub User Sign-in feature where Amazon Cognito provides authenticated identities through Amazon Cognito User Pools and public identity providers—Amazon, Facebook, Google, and SAML. for this tutorial, just know that we’ll be using Amazon Cognito unauthenticated identities to demonstrate this topic. After the project was created with the default Amazon Cognito identity pool, you then enabled the User Data Storage feature in your Mobile Hub project. 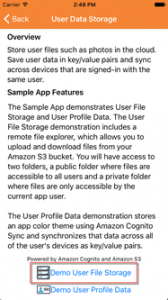 This feature first creates an Amazon S3 bucket to store user photos and creates a policy within the AWS Identity and Access Management (IAM) role that grants your user’s access to Amazon S3 when they launch the app. 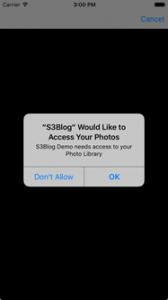 Within the S3 bucket, a /Public folder was created with access permissions set to allow all users of your app to view and upload files stored there. There’s also a /Private folder created, which we’ll discuss in the next blog post. This folder is used to store private data for each user when authenticated through the User Sign-in feature of Mobile Hub. The user launches the app and immediately that user is given a unique unauthenticated Amazon Cognito Identity. 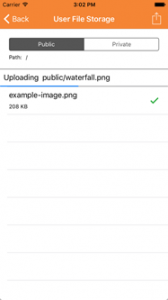 The user then selects the User Data Storage demo feature to upload a photo from his or her photo library to the /Public folder within the S3 bucket. The unique unauthenticated Amazon Cognito Identity given to that user provides limited-privilege credentials to directly access the /Public folder of your S3 bucket. Now that we have created file storage that is designed for scalability, let’s go demo the app! Now for the fun part. In the previous step 1, you configured the AWS resources you needed, built the sample app project code, and downloaded it to your Mac. At the end of this walkthrough, we’ll go into how Mobile Hub guides you in integrating these features into your own app. For now, we’ll now describe how to open the sample project code in Xcode and run the iOS sample app on a physical iOS device or simulator. It’s that simple. 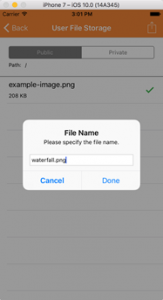 The iOS sample app provides a demo for retrieving files from your S3 bucket and uploading photos from your iOS device photo library. Mobile Hub has placed a sample image to get started. 2) Open the sample app project in Xcode by double-clicking on the Xcode project, MySampleApp.xcodeproj, which is in the project folder. 3) Select build/run within Xcode to build and run the sample app. 4) At the main screen of the sample app, select User Data Storage and then Demo User File Storage feature. You are now in the User File Storage demo and you’ll see example-image.png, which Mobile Hub provided to get started. 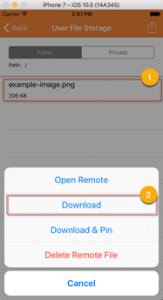 You can now download the example image from Amazon S3 to your device. 5) To download an image from the list, select the file and then choose Download from the action item list as shown. Here’s the sample function that is used to download files from Amazon S3 to the mobile app. You should now see a green check mark next to the example image, which indicates that it has been downloaded from Amazon S3 and cached locally in the app. Now you can upload an image to Amazon S3 from your camera roll. 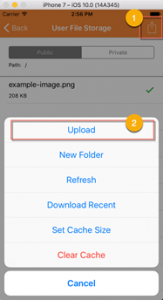 6) To upload a photo from your photo library to Amazon S3, select the action icon on the upper right of the screen and then choose Upload from within the User File Storage demo of the sample app. 7) The app will request access to your photo library. 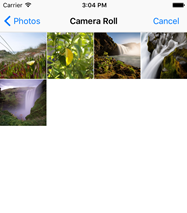 Select OK.
8) Now the app has access to your camera roll and you can select a photo to upload to Amazon S3. Here, you can select a waterfall image. 9) After you select an image, you are prompted to give your file a name. Give it a name and make sure you add .png to the end as shown so the app can recognize this as an image. Select Done and you’ll see the activity indicating the image is being uploaded to Amazon S3. After the image upload completes, it’ll show in the list but without the green check mark, which indicates it’s now in the cloud (stored in your S3 bucket) but not cached locally in the app. Here’s the sample iOS Swift function code used for uploading images from your app to Amazon S3. We just provisioned AWS backend resources consisting of an Amazon Cognito ID and Amazon S3 bucket using AWS Mobile Hub. We then built and launched the generated sample app. 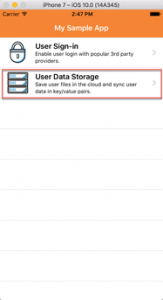 The app demonstrates the User Data Storage feature by uploading photos from your iOS device to Amazon S3 and downloading photos from Amazon S3 to your iOS device. Are you done playing? We hope you enjoyed this tutorial. Stay tuned for the next installment where we’ll build on this idea and add user sign-in for more private storage and user data sync. Are you interested in looking behind the curtain? To see that image you uploaded in the S3 bucket that was created for you, choose the Resources button on the left-hand navigation of the Mobile Hub console, choose the link in the tile labeled Amazon S3 buckets to open the Amazon S3 console, then choose the Public folder. Planning to integrate this feature into your own app? No problem! In step 3, next, we’ll walk you through the Mobile Hub integration guide, helping you integrate all the code from the sample app into your own app. You just configured a backend file storage and ran our generated sample app to demonstrate the end-to-end functionality of this common mobile feature. However, what you really need is the same functionality in your own app. Mobile Hub provides integration instructions specific to each mobile project you create. Let’s get started. Go back to your Mobile Hub project in the console and select Integrate. The integration instructions from Mobile Hub will first walk you through Getting Started and then describe each feature you enabled in your Mobile Hub project and how to integrate each of them into your own app. Copy the AmazonAws folder from the helper code to your project and add a group for it. This source code contains a customized helper framework that simplifies the use of all the SDKs that are required to support your project.It also contains the AWSMobileClient.swift file, which bootstraps the app and creates an identity manager to establish the user identity with Amazon Cognito. Copy the AWS dictionary from the integration Info.plist into your own project Info.plist. The AWS dictionary already provides all the CognitoIdentity pool IDs for your project as well as the S3 bucket and region. View or copy the example upload/download source code provided. The idea is to use this code in your own UIViewController. We just configured a backend data storage feature via AWS Mobile Hub, generated a fully functional sample iOS app demonstrating uploading and downloading photos to and from S3, and then walked through integrating the client code into your own app, connecting to the same backend resources demonstrated in the sample app.